We woke to Abaco pink with an edge to it. 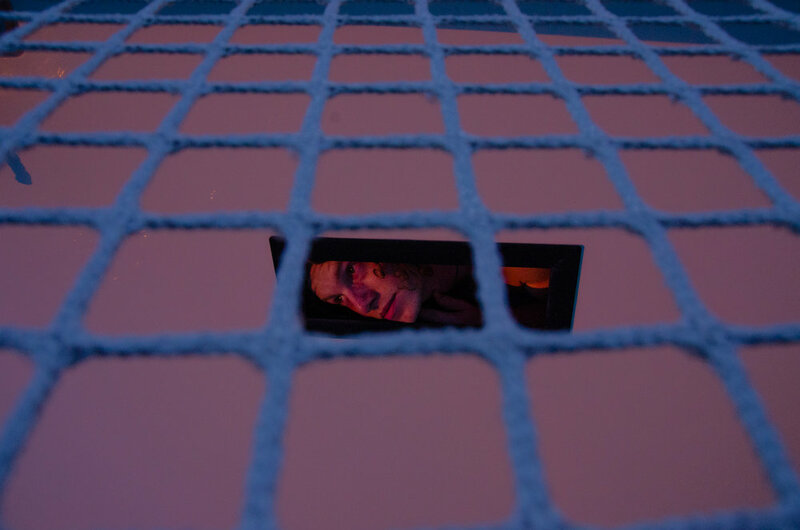 Zack takes a pinkish peek out of his side hatch to get a glimpse of the morning skies. A few had been awake in the night and had seen lightning all around the bay. I missed that somehow, but I do know it did not rain as predicted. And so it seemed the sky was full and ornery with keeping something in. The horizon held a big dark shape, and as we prepped for our swim, we thought for sure it would come for us. “Fate whispers to the warrior, ‘You cannot withstand the storm.’ The warrior whispers back, ‘I am the storm’”. And with that, we charged. We had planned for a big long swim this morning, giving everyone the flexibility and freedom to go as long and as far as they wanted with a cap of 2 hours. Without hesitation or fear the group jumped in, heads down and swam headlong into the darkening skies. I thought for sure we’d end up swimming in the pouring rain - something I absolutely love - but I guess the storm understood we were coming for it, and it swept past us without a drop. 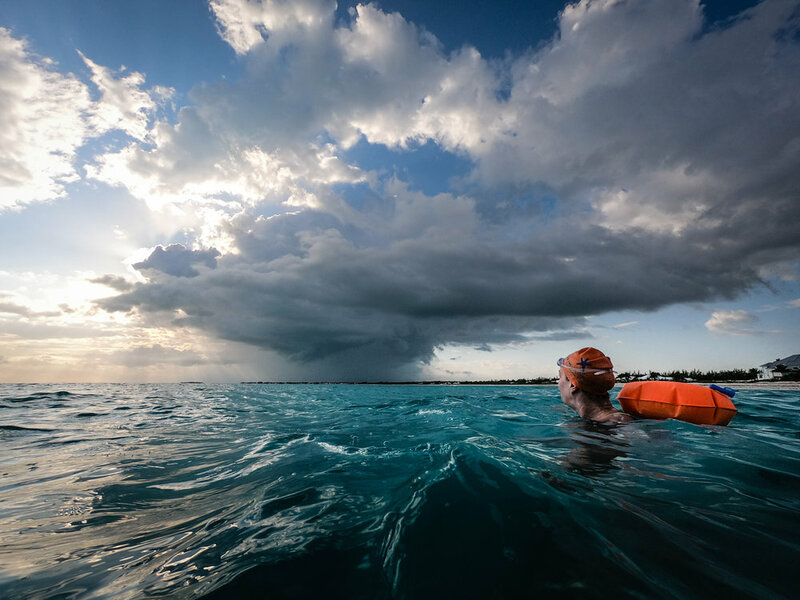 It gave us some fantastic light however, and our swimmers seemed charged by the dynamic skies. Everyone was independent and great about knowing their limits, knowing what their bodies needed after two full days of swimming. Half the group cruised for about an hour and hit the shore for a beach walk back to the position of the boat. The other half plus guides pushed on, feeling the bliss of the milky turquoise shallows, bouncy with storm-fringing winds. We swam together some, split up some, met for photographs and remarking about how cool and special a morning swim this was. In the end, Patty and I were the last two out of the water, having gone just over two hours and loving every minute. We crawled back aboard to waiting poached pears - thank you Miriam! 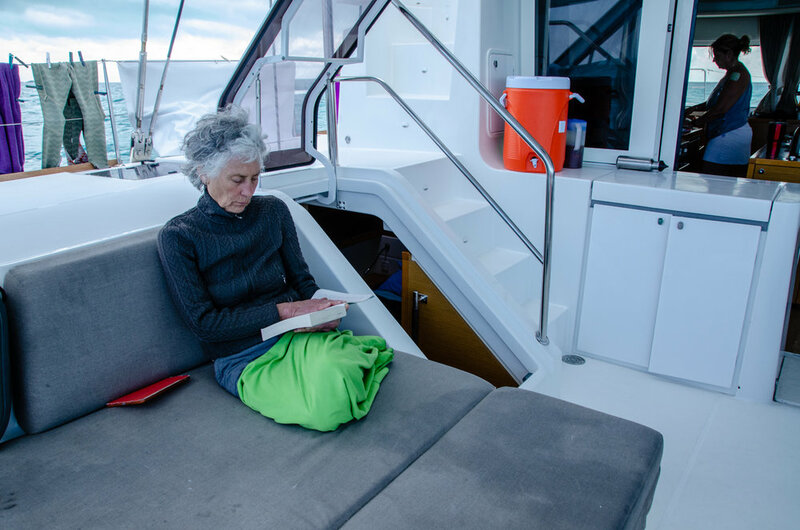 A relaxing sail under overcast skies gave everyone the excuse to nap, or watch the horizon, fall into an easy, well earned quiet and just Be. We’ve just arrived at Fish Cays - a spot we’ve adored in the past for its wildlife offerings. Before we go explore, we’ll fill our bellies with the warming pea soup and grilled cheese offerings of Miriam. Perfect for a slightly blustery day where we have showed the storm that its ominous face won’t stop us from being in a blue sea. Right. So. Bellies full, naps were had. We jumped in at Fish cays, divided into two groups - those that wanted to swim, and those that kind of didn’t (after this morning’s swim, who can blame us, er, I mean, them?!) So the swimmie swimmers planned a course in a figure of 8 around two of the cays. 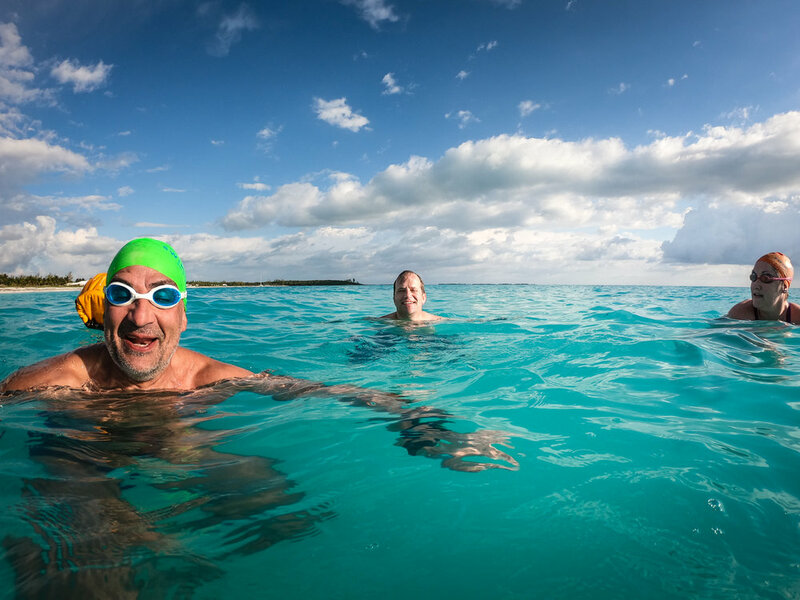 The snorkel swimmers planned a once around the nearest cay, with the mission of looking for wildlife. It was a bouncy fun scavenger hunt, yielding a little yellow stingray, large and small schools of large and small fish, and a baby nurse shark. Made of ancient coral reefs uplifted above the sea surface, these little cays act like the mangroves in other places, and form a nursery grounds for all sorts of reef creatures. Topped with gardens of greenery and trees with silver leaves, lined with bright orange vines…the whole scene is like some kind of garden of Eden. We did our lap and climbed back aboard, stretched out in the sun beneath the sail that carried our boat to our anchorage for the night. As we sailed, the skies, still undecided and confused by us, went from bright to gray and back again, each time revealing a new shade turquoise in the sea beneath us. It really seems hard to believe, the countless shades of turquoise that can come from one body of water. And now here we sit, off another beautiful white sand beach which throws yet another few dozen shades of blue. Everyone is relaxing, more than satisfied with the day’s efforts, the sights, the blues. Music on the sound system, some sort of dip yumminess on the table, laughter and conversation in warm tropical air. Not bad for a day that began with the threat of something a little wicked. I guess after three full days of immersion, we are the storm, the swim, the fish, the light and the so many shades of sea. It’s hard to know where these things end and we begin. Oh look, Robert just jumped in again. He’s ending the day the way he began it. I think I’ll go join him.